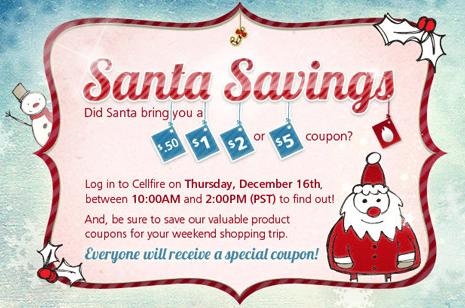 Cellfire is Spreading the Holiday Cheer with Santa Savings! Did Santa bring you a $.50, $1, $2 or $5 coupon?Log in to Cellfire on Thursday, December 16th between 10:00AM and 2:00PM (PST) to find out! And, be sure to save our valuable product coupons for your weekend shopping trip.To find out what Santa brought you, log-in to Cellfire anytime during this 4 hour window. Must be a registered member with a Kroger/Kroger subsidiary store savings card. If you aren’t a member yet you better sign up! Next post: Save $10.00 on a $30.00 purchase at World Market.